Keep track of every inch your little bean sprout shoots up with Miss Natalie's Heirloom Growth Chart. Dreamed up by California-based designer Natalie Davis, this growth chart is made to last through many kids and even many generations. It's made from a 4-inch long jute cloth and comes with 20 tags ready to be filled out with your child's name, age and the date. Track multiple kids with different colored tags. They can be pinned to the chart at the appropriate height. The beauty of Miss Natalie’s Heirloom Growth Chart is in its versatility. 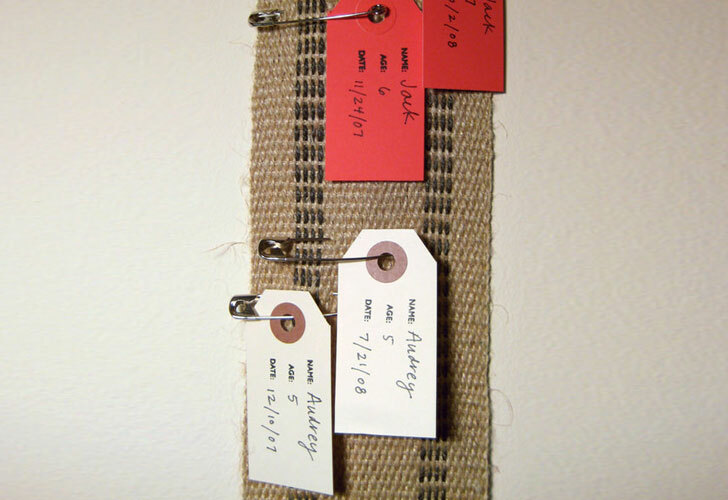 You can hang and rehang the jute cloth, unlike those permanent marks you might add to the door frame. This is a great feature for transient families that may move in between growth spurts and for those who want to use and re-use it for years and generations to come. Also, you aren’t actually marking up the base of the growth chart – you’re only writing your child’s height information on the tags and then pinning them to the jute. This means that once your child has reached his top height, you can remove the tags and pass it on to the next growing tot you know. The growth chart is beautifully packaged in a wooden box and comes with a muslin bag filled with large safety pins. It’s gorgeous for gifting, but you might want to grab this one for yourself! The beauty of Miss Natalie's Heirloom Growth Chart is in its versatility. You can hang and rehang the jute cloth, unlike those permanent marks you might add to the door frame. This is a great feature for transient families that may move in between growth spurts and for those who want to use and re-use it for years and generations to come. Also, you aren't actually marking up the base of the growth chart - you're only writing your child's height information on the tags and then pinning them to the jute. This means that once your child has reached his top height, you can remove the tags and pass it on to the next growing tot you know. The growth chart is beautifully packaged in a wooden box and comes with a muslin bag filled with large safety pins. It's gorgeous for gifting, but you might want to grab this one for yourself!